Drifting in and out of various history groups on the net, a very strange thing has become apparent. There are some out there who truly believe Richard III’s death was ‘the end of the Middle Ages’ and that he stood in the way of the wonderful, burgeoning Renaissance like some great big dinosaur with both feet firmly planted in the past. Of course, by pretty much anyone’s standard, Henry Tudor was a ‘medieval king’ as much as Richard, and the Renaissance wasn’t halting for anyone–it was firmly on its way to England and had been for some years prior to Bosworth. Richard certainly was not stopping it. But putting that aside, there has also been on occasion rather extraordinary comments to the effect of ‘Francis Lovell was a remainder of the ‘old guard’ too set in his ways to embark on the bright new course laid out by Henry Tudor’. This gives a wrong impression that somehow Henry Tudor was a uniquely inspired youth, while Lovell and Richard were a pair of ancient stick-in-the-muds, both figuratively and literally! I even read one blog where Henry at Bosworth is described as the ‘young Henry Tudor’, implying that Richard was much older than him, not a mere four years. As far as age confusion, it happens a lot with Richard, but there was a bit of a turnaround at the Bosworth re-enactment this year, and I don’t mean the alternative battle where Richard won the day. The commentator slipped up, and told the crowd that Henry was ‘an older man’ at the time of Bosworth. Oops! “This seemingly innocuous verse was in fact a searing criticism of those in power at the time it was written in 1484, and was found pinned to the door of St Paul’s Cathedral and other prominent places all over London. The rat was King Richard III’s confidante, Sir Richard Ratcliffe, the cat was Speaker of the Commons William Catesby, and Lovel was Viscount Lovel, who had a reputation for being the king’s ‘lap dog’ or ‘yes man’. King Richard’s emblem was a white boar, hence the reference to a hog. Oh well, yet another writer who doesn’t realise that it wasn’t the verse that got Colyngbourne executed, but the treasonous plotting in which he was involved! Here is the truth. Colyngbourne set himself against Richard III from the outset. He seems to have been caught up in Buckingham’s rebellion, apparently in favour of Henry Tudor. Clearly the fellow preferred a Lancastrian with no claim at all to the throne, to a king who was legally and truly on the throne. On 10 July, 1483 or 1484, Colyngbourne contacted Richard’s enemies, including Henry Tudor, “to declare unto them that they should very well to return into England with all such power as they might get before the feast of St Luke the Evangelist” (which was 18 October) and “to advise the French king, that negotiations with Richard were useless as the new King meant to make war on France.” He urged Tudor to invade and land at Poole. (Which Tudor did indeed try to do—unsuccessfully—during Buckingham’s Rebellion in October 1483). Colyngbourne was certainly stirring up dangerous trouble against Richard. His motives aren’t really known. He could simply have been in a miff for having lost positions, including that of being steward of the Wiltshire lands of the king’s mother, the Duchess of York. This position went to Francis Lovell, which probably accounts for the latter’s inclusion in the infamous lampoon. Whatever Colyngbourne’s reasons, he paid the price of communicating with and encouraging the exiled Henry Tudor to invade Richard’s realm and land at Poole. No king could let this pass without punishment, so Colyngbourne was arrested, tried, (rightly) found guilty and executed on Tower Hill. Yet even today, writers repeat that it was the verse that cost him his duplicitous life. According to Tudor author Edward Hall, Colyngbourne was executed “for making a small rhyme”. This was a charge that was picked up on by later writers, until Charles Ross corrected it, saying that Hall had carefully suppressed “the fact that the real indictment against him was that he had been encouraging Henry Tudor to land at Poole”. If I’d been Richard, I’d have condemned such a traitor as well! Wikipedia gives a fair account of Colynbourne’s activities. New theories DO turn up, so there’s hope for some Ricardian mysteries…. Another new theory about the fate of Jimmy Hoffa has raised its head. Hoffa’s disappearance in a Michigan parking lot forty-two years ago has always been a mystery. “. Hoffa was a Detroit labor union leader and activist who was well known for his involvement in the Teamsters’ Union as well as the criminal charges that he faced while president of the organization. ” He was also mixed up in the Mob and various other extremely dubious matters. In short, he was very well known and equally as notorious. Then, he simply disappeared, apparently from the face of the earth. A new theory seeks to explain what might have happened. Read about it he re. Followers of the case, or mob afficionados, will know there are more theories as to Hoffa’s disappearance, and indeed more books for sale than you can throw a stick at. He went into hiding. The union had him killed because he threatened to talk. The mob had him offed because he threatened to reveal their shady dealings with Teamster pension funds. For years, the most popular theory was that he was buried underneath the Meadowlands Football stadium in New Jersey, but this has been disproven as the above linked story indicates. So despite many concerted attempts by law enforcement and cold case amateurs alike, we still don’t know. Which inevitably brings us to similar Ricardian “cold cases”. The boys in the Tower are usually the first to spring to mind. They too seem to have simply disappeared without trace. And then there’s Richard’s last will and testament, which he must have had drawn up before Bosworth, if not well before even that. It disappeared. Whodunnit? No, I won’t mention the word T-d-r! There are other mysteries, of course. What happened to Francis Lovell? He too seems to have simply vanished from the records. What was Buckingham’s real purpose in rebelling against Richard? His own ambitions? We don’t know. And where did Richard’s crown go after being found at Bosworth? Maybe the latter is known, but not to me. I know there are many, many more unknowns from Richard’s life. So, all in all, some new theories about these Ricardian mysteries are eagerly awaited. They all happened a lot longer than forty-two years ago, of course, but is there a statute of limitation on these things? BREAKING NEWS! TROLL CATS DEMONSTRATE TO THEIR HUMAN COUNTERPARTS HOW ITS DONE. A group of cats, known as a moggle, have been discovered by their incredulous owners, to have been routinely trolling. Not only that but the surprised owners discovered that the felines were actually a lot better at it than their human counterparts even though some of them did not have thumbs – well none of them had thumbs actually. Asked where they liked to troll best they said anything featuring Henry Tudor was fair game. When they were questioned why, and who their favourite king was, they all concurred Richard III because it was well known he liked and admired cats as although they were small in stature they had hearts like lions – unlike Henry Tudor who was a complete waste of a good suit of armour, spending the whole of the Battle of Bosworth behind a pike wall! Pausing only to regurgitate a fur ball, one of the group, Percy, explained that Tudor liked nothing better than setting his favorite greyhound, Morton, onto any innocent passing cat just because he could. However, one of the group, Bowfoot, did demur that he thought Henry, although a coward, was not bad looking as he thought the cross-eyed look very handsome. Percy. Although lacking teeth Percy remains a happy chap unlike Henry who also lacked teeth as well as a sense of humour..
Jockey, originally from Norfolk, does share some similarities to human trolls in that he likes to spend his days divided equally between sleeping, eating and trolling in no particular order. Cissie, the matriarch of the group, demonstrates she can type without looking at the keyboard. Cissie is well known for not being able to tolerate fools easily – human trolls should give this particular cat a very wide berth..
Bowfoot opined that he thought Henry quite handsome as the cross-eyed look was very fetching indeed. Ratcliffe..if only all trolls were as handsome,,. Morton VIII. This chap is a direct descendant of Henry Tudor’s favorite greyhound Morton…but that dear reader, is another story.. The story of Richard and Francis as children…. This fictional tale for younger readers, by Stuart Hill, relates the story of the young Richard III and his lifelong friend Francis Lovell when, as boys, they trained to be knights at the castle of the Earl of Warwick, now known as the “Kingmaker”. I’m told it’s a charming story that introduces a new young audience to what life could be like back in the 15th century. If you have children of the right age, or little relatives and friends, it might be an excellent way to show them our history. It’s one of a series of books called “I Was There”, so you can pick your period. But you WILL begin with Richard, right? Available on Amazon.co.uk, Amazon.com etc. Hey diddle diddle, it’s Richard III….! The suggestion that the rhyme might be to do with Richard’s so-called usurpation of the throne connects Sir William Catesby with the cat (the fiddle being to kill the boys in the Tower), the Kingmaker with the cow (no idea about the moon!) Francis Lovell with the dog, and Richard himself as the dish running away with the spoon (anointing spoon at his coronation). Why the Kingmaker is in there, I can’t imagine, for he was dead and gone by 1383, which is when the presumed events of the nursery rhyme took place. Mind you, if you go here, you’ll find Richard’s name cropping up in all sorts of places, including Humpty Dumpty! See also here. 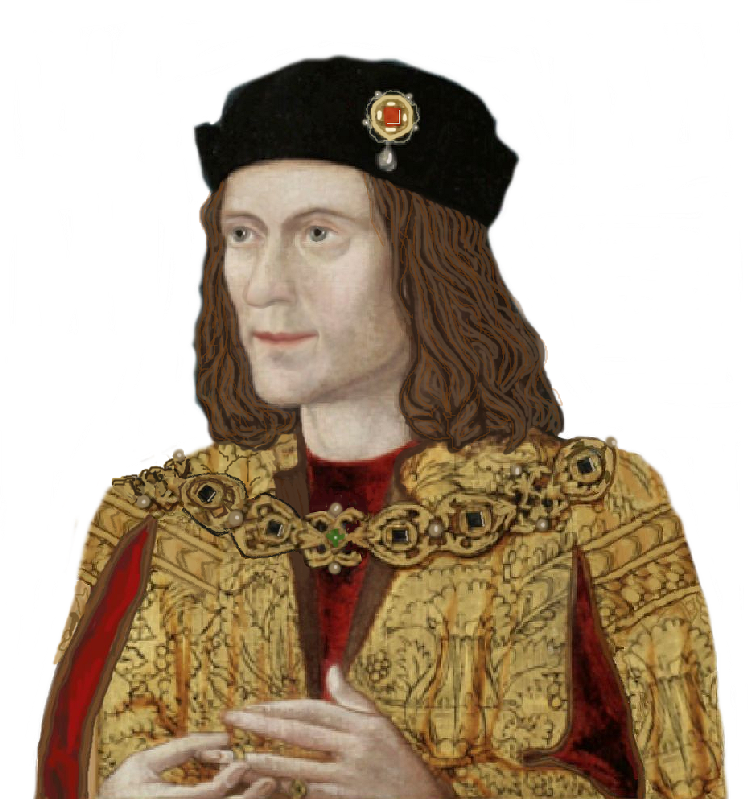 A Google search for Hey Diddle Diddle or Humpty Dumpty with Richard III will bring up numerous sites that repeat/debate/pooh-pooh the likelihood of the rhymes’ origins in Richard’s story. The king in the above illustration is presumably Henry VII? Anyway, it’s all an interesting theory, but I do not know how much faith to place in it. Take a look, and see what you think.